and other workers demanding the resignation of President Sánchez de Lozada. The Central Slogan Remains: Workers to Power! OCTOBER 26 – After weeks of massive and increasingly combative mobilizations, on October 17 Bolivian president Gonzalo Sánchez de Lozada fled the country, leaving his vice president Carlos Mesa in power. 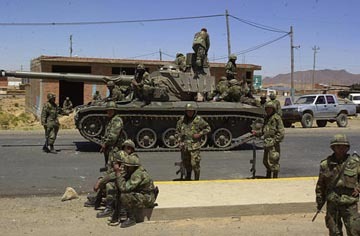 What set off the conflict was “Goni’s” plan to carry out a new looting of Bolivia’s natural resources through a sweetheart contract with a consortium of imperialist companies. In order to please his masters in Washington, the murderous president drenched the country in blood, with a toll of 140 dead and some 500 injured, according to the figures of the Central Obrera Boliviana (COB – Bolivian Labor Federation). The repression was coordinated with U.S. military commanders. 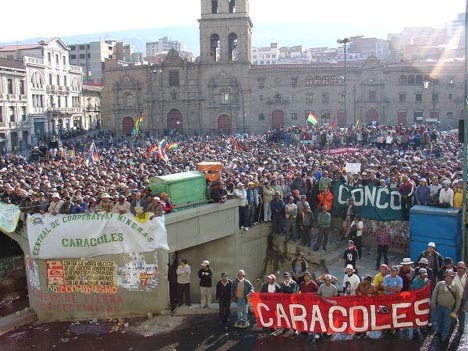 Furious demonstrators wrote on the walls in the center of La Paz, “Goni, either you go or we’ll kill you.” The next day, San Francisco Plaza in the Bolivian capital was filled with tens of thousands of workers and peasants celebrating the departure of the bloody tyrant. 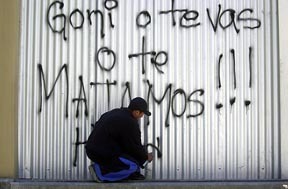 “Goni, either you go or we’ll kill you.” Demonstrator in La Paz paints his dramatic message, October 16. The next day the murderous president left. It was the miners who were decisive in forcing the flight of Sánchez de Lozada. When they managed to pass the military barrier at Patacamaya – where three of their comrades were killed by the army – the president’s last day had begun. His fate was sealed with the arrival of more than 10,000 miners in the center of La Paz on the morning of Friday, October 17. 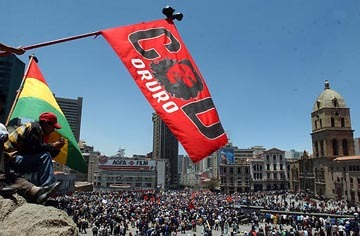 In the city of El Alto, the poorest city on the continent with some 600,000 inhabitants, demonstrators were constantly chanting for “civil war.” Yet by granting an “intermission” to “Goni’s” successor, the leaders of the COB, together with those of the Movement for Socialism (MAS) and the Indian movement, betrayed the workers who fought so heroically against the puppet regime in the “gas war.” They stabbed the burgeoning workers uprising in the back; in reality, they feared it as much as the bourgeoisie did. Many fake leftists are hailing the “victory,” but toppling the hated president and replacing him with his anointed successor is hardly a victory. The League for the Fourth International, in contrast, denounces the betrayal by the misleaders of the workers and peasants – including those who claim to be revolutionaries – in granting a “truce” to the new president. Mesa is a puppet of the armed forces and imperialism, who has the backing of the White House, the International Monetary Fund and the World Bank. We warn that the new president is wedded to the same program of privatization, poverty and pillaging of the country by the “multinationals” as his godfather Sánchez de Lozada. But the final outcome is yet to be determined. The workers are still on the alert, ready to mobilize again. We stress that the central demand continues to be: Workers to power! The urgent task is still the construction of the nucleus of a genuinely Trotskyist Bolshevik party. In the confrontation at Patacamaya, where the army dispatched two tanks and a plane against the crowd, the military finally let the marchers pass after several thousand miners managed to get around the blockade. Together with university students from Oruro, the marchers headed to La Paz where they joined with thousands of workers, peasants, students and residents of poor neighborhoods in the midst of a general strike which brought the country to a halt. Radio stations broadcast the position of the residents of El Alto: “anyone who engages in dialogue is betraying, the moment to take power has arrived” (Pulso, 17 October). With a heavy presence of workers and Aymara Indian peasants, El Alto was the epicenter of the uprising. According to journalists’ reports, the Federation of Neighborhood Committees (FEJUVE) pointed to the need to set up self-defense groups against the onslaught of repression. This ruling-class Operation Rescue is having success for the moment due to the absence of a revolutionary leadership and the betrayal of the reformist and nationalist leaders who still remain at the head of the mass organizations of the working people. The maneuver by the domestic bourgeoisie and imperialism received the backing of the “opposition” parties. In the first instance, this means the MAS, headed by Evo Morales, leader of the coca-growing peasants, and the Pachacuti Indian Movement (MIP) headed by his rival in the peasant movement, Felipe Quispe. Morales declared: “We will give a breathing space to President Carlos Mesa, a truce, so that he can organize and carry out his promises to the country.” Quispe, who is known as “El Mallku,” said, “We will be vigilant so that the necessary economic and political changes can be carried out,” and he even joined Mesa during a peasant demonstration in La Paz on October 20. It was the same story with the workers leaders. Following the departure of “Goni” and with his vice president now installed in the presidential palace (the Palacio Quemado), the union leaders gave him their support: “We have indicated that Mesa will have our backing as long as he energetically fights corruption,” said the executive secretary of the COB, Jaime Solares, following a personal visit with Mesa on Saturday, October 18. This will allow Sánchez de Lozada’s deputy to continue in power simply by carrying out a minimal “investigation” of the millions that “Goni” and his defense minister, Carlos Sánchez Berzaín, carried off with them. But Solares didn’t simply give after-the-fact support to a fait accompli. Even before Congress opened its session and Mesa assumed the presidency, the latter called Solares to ask for “guarantees,” and the head of the COB gave them. Miners’ leader Miguel Zuvieta admitted, “No union and no left party imagined the magnitude of the conflict that was approaching…. The massacre of El Alto (October 12) was the detonator that set off the war against the government and imperialism. From that point on, the conflict got out of our hands. It was uncontrollable.” So finding that they could not control or contain the explosion of fury by the working masses, the leaders decided to call off the indefinite general strike, take down the highway blockades and give Mesa a deadline of 90 days. The leader of the Oruro Departmental Labor Federation (COD), David Rojas, spoke of “waiting for the results of the new president’s administration” (La Patria [Oruro], 19 October). For its part, the Bolivian “Communist” Party, which has carried out a thousand Stalinist betrayals, calls on Mesa to adopt an emergency plan, warning that its absence “is a threat to the stability of the new government,” which is being “questioned by ultra-leftist and radical sectors who irresponsibly believe that the moment has arrived for revolutionary change” (PCB communiqué, 22 October). Calling on the police butchers to defend “the interests of the people” is sowing suicidal illusions. Many left groups have encouraged illusions in the role of the police in Bolivia, both last February and today. But showing a white flag and letting demonstrators through is hardly the same as going over to the insurrectionary masses, as the opportunists pretend. The police are professionals of repression, specializing in attacks on the workers. In the case of the army, we have called for the formation of councils of the worker and peasant conscript soldiers against their bourgeois officers. In contrast to the pseudo-leftists, revolutionaries tell the truth, that the police and military officialdom are the armed fist of the bourgeoisie, the backbone of the capitalist state. Down with “Democratizing” Counterrevolution – Workers to Power! One of the most notable aspects of recent days has been the effort by the Bolivian bourgeoisie and its imperialist masters to channel the masses’ anger into a phony “democratic” way out of the crisis. In this, they have been able to count on the aid of almost the entire spectrum of the opportunist left, from the “opposition” benches in parliament to the supposed far left, including those who proclaim themselves Trotskyists. Even liberal sectors joined in demanding the resignation of “Goni” (see cover of the extra edition of the weekly Pulso), presenting the issue as if it is one of (bourgeois) democracy. Marxists fight for a revolutionary class program. For some time now, Evo Morales’ MAS has been urging the calling of a constituent assembly to “refound the country” with a new constitution. Tailing after it are several left organizations, including the small Liga Obrera Revolucionaria – Cuarta Internacional, affiliated with the Fracción Trotskista headed by the Argentine PTS (Socialist Workers Party). The LOR-CI’s programmatic calling card has been the demand for a constituent assembly, to which they tack on the adjective “revolutionary.” But there is nothing revolutionary about this policy, and it is grossly tailist. 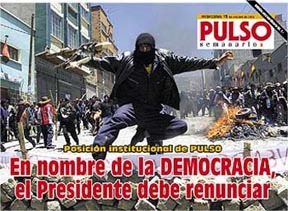 In a supplement to their paper Lucha Obrera (29 September) they write: “The MAS and Evo Morales have spoken on several occasions of a Constituent Assembly. Now is the time to go from words to deeds and to raise this as part of their action program, because now is when it is necessary to fight to impose this!” In this way, just like the openly reformist outfits, the LOR-CI presents the issue as if it were basically a democratic question. Jaime Solares and other COB leaders brandish the threat that if the Mesa government doesn’t deliver the goods to their satisfaction, they could call a “People’s Assembly.” Since 1971, when the Asamblea Popular was established in the shadow of General Juan José Torres, reestablishing this body has been the great dream of the main pseudo-Trotskyist organization in Bolivia, Guillermo Lora’s Partido Obrero Revolucionario (POR – Revolutionary Workers Party). In reality, that assembly tied the workers to bourgeois sectors and its incapacity to organize resistance to General Banzer’s coup was followed by the formation of a popular front in exile with the very same General Torres. Neither a Constituent Assembly nor a People’s Assembly, but the Bolshevik program of power to the workers, peasants and soldiers councils, like the soviets which took power in the Russian Revolution of October 1917: this must be the program of genuine revolutionaries in Bolivia today. In the months leading up to the October Revolution, the opportunist parties told the peasants that a “constituent assembly” would grant them land and would put an end to the imperialist war. The Bolshevik Party led by V.I. Lenin and Leon Trotsky urged them to seize the land with their own hands. To the workers and soldiers they said that they, together with their peasant brothers, should take all the power, extending the revolution to neighboring countries and to the powerful proletariat of the imperialist countries. In Bolivia, ever since colonial times the indigenous peoples have been subjected to brutal oppression and exclusion. In this country, where since the rebellion of Túpac Katari in 1781 the bourgeoisie has lived in fear of the spectre of an Indian siege of La Paz, we call to fight for a worker-peasant-Indian government, that would be the dictatorship of the proletariat against the dictatorship of capital. We emphasize that the foundation of the revolutionary program is proletarian internationalism, which is the opposite of the anti-Chilean nationalism which only places obstacles in the way of the necessary unity with the workers of Chile, Peru and all of Latin America. A workers revolution in Bolivia would have to be extended to the entire region, seeking to form an Andean federation of workers republics, as part of a Socialist United States of Latin America. It is crucial that it extend as well to the proletariat of the United States in a struggle that would defeat imperialism and all of its “running dogs” in the semi-colonies once and for all. Despite the “truce” decreed by the tops, in the ranks the struggle continues. The peasants have seized the lands of the Sánchez de Lozada family. The slogan has been raised to occupy “Goni’s” mines, and that the miners themselves should impose the expropriation of all the mines and workers control of production. In the Chapare region, repression continues against peasants who are demanding freedom to cultivate and sell coca and who oppose imperialist programs for eradicating the crops. It has been reported that when the Bolivian president visited the White House a year ago, he told President Bush that if he continued this eradication program, “I may be back here in a year, this time seeking political asylum” (New York Times, 23 October). And that turned out to be true. We defend the struggle of the coca-growing peasants in Bolivia, where the use of the coca leaf has been traditional since time immemorial. We stress that in order to break the stranglehold of Yankee imperialism it is necessary to confront the “war on drugs” unleashed by Washington. In reality, this is a war against the oppressed masses of Latin America and against the black ghettos and Latino barrios in the United States. Marxists oppose the outlawing or penalization of drugs (just as we also oppose laws against alcohol). In the course of the mobilizations, many undeniably important demands have been raised, among them the call for repeal of Decree 21060 and the Oil and Gas Law; imperialist troops and advisors out; for a living minimum wage with a cost-of-living escalator to compensate for inflation; immediate cancellation of all arrest warrants, and other demands as well. In order to fight for these demands, it is fundamental to put forward a strategy and perspective of permanent revolution, for consistent class struggle capable of wrenching the urgent needs of the working masses from the grip of the ruling class. At every decisive turn of the class struggle, the sellout leaders have turned power over to the bourgeoisie. This was the case in April 1952, when Juan Lechín and his followers handed power on a platter to Víctor Paz Estenssoro and Hernán Siles Zuazo of the MNR (Revolutionary Nationalist Movement). This was the case in 1970-71, when the Comando Político of the COB acted as an adjutant for General Torres. This was what happened in 1982 when the military dictatorship fell and a bourgeois popular front of Siles Zuazo, Jaime Paz Zamora and the PCB was brought in. That government paved the way for the return of MNR chief Paz Estenssoro so that he could close the mines and throw thousands of miners out of their jobs. And so it is today, when Solares and the COB hand power to Mesa, with the approval of the MAS, the MIP and the rest of the “opposition” parties. “With regard to countries with a belated bourgeois development, especially the colonial and semi-colonial countries, the theory of the permanent revolution signifies that the complete and genuine solution of their tasks of achieving democracy and national emancipation is conceivable only through the dictatorship of the proletariat as the leader of the subjugated nation, above all of its peasant masses…. “If you have to overthrow, give us a call,” say the miners. What's needed is to prepare the overthrow of the capitalist system of exploitation and death. 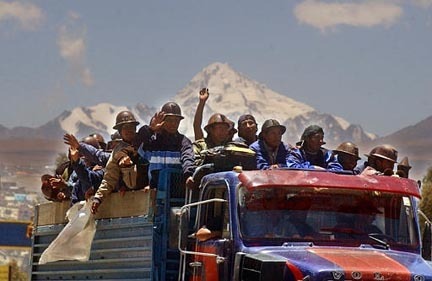 Miners leaving La Paz pass through El Alto, October 18. The following is the account of a university student from Oruro, historic center of Bolivia’s mining region, who participated in one of the marches to La Paz. We left on a march from Oruro to the city of La Paz. The pro-government forces had put out a series of lies, and they brought their people out to say a lot of things against us. They even had members of the MNR [the Revolutionary Nationalist Movement, party of then-president Sánchez de Lozada], who made a show of crying and saying, “Don’t go on the march, kids.” Despite all of this, we university students went to La Paz. Confrontation between marchers and the army in Patacamaya, October 16. Marching on the highway to La Paz, we went through Patacamaya. There were miners from the Huanuni and Colquiri cooperative mines, as well as members of the retail vendors’ organizations. There were more then five thousand. The day before, the military used a plane to strafe the miners. People were having a wake for three dead miners there. 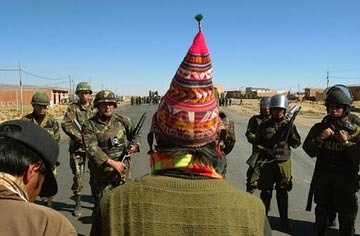 At Patacamaya there were soldiers blocking the miners from continuing on to La Paz. We arrived, there were a thousand or more students from Oruro and we arrived in the afternoon. We were told there were soldiers there and that we could not continue on the road. The next day they let us through, as we saw there were not a lot of them and it would be possible to get past them. From Patacamaya to La Paz we did not encounter any more obstacles. We arrived in La Paz on Friday [October 17], when Sánchez de Lozada had already resigned. A ‘mobilization committee’ met us there. In various places people have chanted ‘Workers to power.’ Even at the most recent assembly of the Oruro COD [the regional labor body affiliated to the COB labor federation], people were yelling the slogan “Workers to power.” But if no clear answer is being given, I think it can all go the wrong way because the bureaucracy and its cliques use two-faced language. There were in this movement, but only to weaken it. In La Paz there were people who did not agree with Carlos Mesa taking over, and who said that things could have gone much further. People in El Alto were quite radical when they received the university students and other sectors, more radical than in La Paz, in fact. So we were met with vivas and chants of ‘Death to Goni.’ All along the road, it was striking to see the solidarity shown by the peasants, by people who are very poor.